Ryu Mitsuse. The Sunset, 2217 AD. James Tiptree Jr. Mother in the Sky with Diamonds. Harlan Ellison. At the Mouse Circus. Harlan Ellison. Silent in Gehenna. H.H. Hollis. Too Many People. John Brunner. The Easy Way Out. 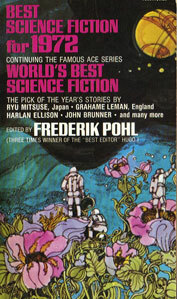 Frederik Pohl. The Gold at The Starbow’s End.